The electron collision rate is sensitve to many influences. Please see M. A. Lieberman, A.J. Lichtenberg, Principles of plasma discharges and materials processing, John Wiley & Sons, Inc., 2005.
band measurement) is not possible. The asymmetry of the plasma discharge is defined as the ratio of sheath voltage at the chamber wall to the sheath voltage at the wafer. Equivalent to DC Bias, not any longer available due to usage of ESC. - The faster the asymmetry changes, the larger the short time DC current. is the net energy gain of electrond per RF cycle through maximum energy of electrons. Heating or cooling (net gain or loss) of all electrons during one RF cycle in plasma body, close to boundary sheath, given by the energy flux density, defined as:Extraction of the electron heating in the sheath by a plasma physical model. provide the so called SheathHeating. 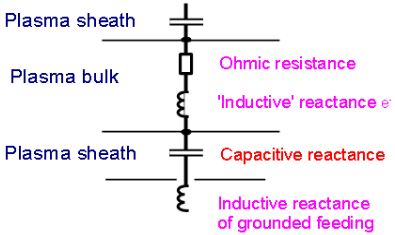 The resonance frequency is the serial resonance of the bulk 'inductance' and the sheath capacitance and is a property of the plasma. The lower the difference between generator and resonance frequency the higher the dissipated RF power in the plasma bulk. A changed generator frequency influences the resonance conditions of the serial oscillator! If the resonance frequency is more then six times larger than the generator frequency the resonance frequency is setting to the six times larger value. The parameter Uniformity edge is described by the ratio of the geometric dimensions of the chamber and the skin depth and is frequency depended. The parameter nonlinearity describes the ability of the plasma to generate harmonics. The value is usually in the range from 0.05 to 0.25. The nonlinearity is used the calculate the resonance frequency and vice versa. Regularly the nonlinearity is set to 1/8. The RF Fundamental is the RF current at generator frequency. This parameter indicates variation of the hardware or the RF sub-circuit (electrode system, matchbox, ...). This parameter shows the amplitude of the sensor signal and is required in order ot checkr functionality of sensor.